Hertz Furniture is committed to offering top quality, competitively priced furniture that meets your needs. We strive to provide the best customer experience possible, whether you're buying a single chair or furnishing an entire campus. Our goal is complete customer satisfaction. We have so much confidence in the quality of our merchandise that we provide Limited Lifetime Warranties on virtually everything we sell on our website, always exceeding the manufacturers' warranties. With the best warranties in the industry, you can buy with confidence from Hertz Furniture. 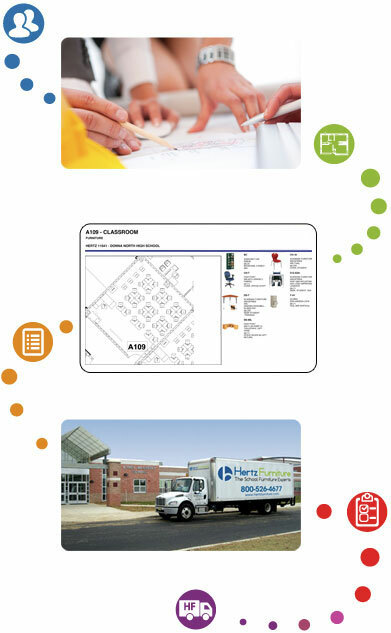 Our project specialists help you design your space for maximum effectiveness, comfort, and affordability, whether you are furnishing a classroom, an office or an entire building. We provide complimentary turn-key design, project, and logistical services so you can focus on the other important parts of your job. To learn more, contact a project specialist. All of our school products meet or exceed ANSI-BIFMA standards for quality and safety, ensuring that you are buying superior furniture. We offer thousands of environmentally friendly items that are certified by organizations like GREENGUARD, SCS and MAS to be compliant with CHPS, LEED or ANSI-BIFMA X7.1. All certified green products are clearly marked on our site. We deliver and install furniture nationwide, including assembly and removal of debris. Ask us for a quote no matter where you are in the continental USA. While we provide online freight quotes, we encourage you to call us for a quote on bulk orders to ensure you get the best rate possible. Many companies lure customers with low prices but lack the infrastructure to actually support them when problems arise. Hertz Furniture is a full-service company, comprised of experienced sales, design, customer service, logistics, and installation experts. Our reputation is our best asset.